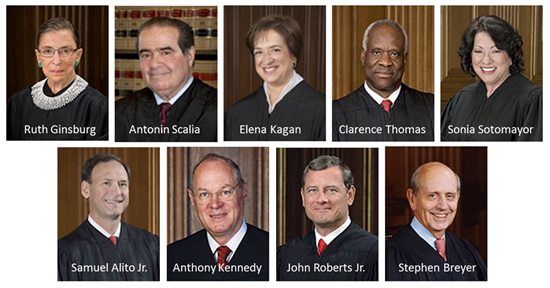 What would life in America look like if just one Supreme Court justice voted differently? In the Court’s 2014-2015 term that ended on June 30, 2015, nineteen cases out of 76 decisions were based on a 5-4 vote by the nine justices. We won’t go through all 19, but the few listed below give you an idea of the importance of the Court’s rulings. Not to mention the importance of voting in presidential elections since the president nominates future Supreme Court justices who may stay on the Court for life. Free Speech: The Court voted 5-4 that a state can deny a request to add the Confederate flag to a car’s license plate. A racially charged symbol of repression is offensive and not protected by the First Amendment. For more on this, see Walker v. Sons of Confederate Veterans.